This morning I got out early and caught bait then picked my clients up at 6am at High Point Marina. 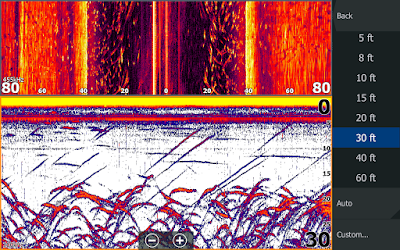 I was looking forward to today's trip because I was taking out a client [Robert] who I have been trying to help crack this code for Striper fishing on the lake. He went out with me last year and has bought all the gear to catch Stripers and still needs some "fine tuning". It was also fun to get back out with his son's family again. 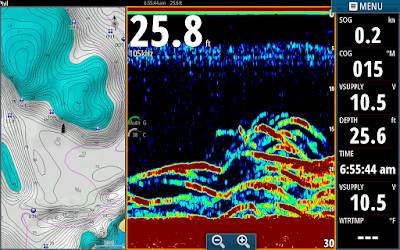 We started by reviewing what I was seeing on my Simrad then we set up where I saw a couple fish and showed them how to deploy the baits and how to reel in the fish. We were all good so we went looking for Stripers. I found the remnants of a school so we set up on them and popped a few Stripers then caught about 6 or 8 Catfish. After hooking up with the catfish I knew the Stripers had moved on and so did we. As I was taking off Abby saw some Stripers spraying on the other side of the flat I was working so we headed that direction. I stopped about 150 yards before the school so I would not spook them. We put the baits out as I was closing the gap towards the school. Next thing I knew all of our rods starting bending over and the game was on. Abby was hooked up in the rear of the boat with her drag screaming so I netted 3 or 4 other Stripers while she battled her fish. Once I netted her fish we had to scramble to get the fish off of the hooks and rebait our rods. As we put them down they would hook up and the kids would reel them in. Couldn't get any better than this, kids on board and rods buried in the water. Zeek and Robert were trying to keep up with taking the fish off of the hooks while I baited hooks and netted fish. The two screenshots below I popped in the middle of all of the action. Notice how many fish were on my side scan page. Also notice how I was using my Navionics card with highlighted depth ranges. I was staying right on the break where the blue and white shades meet. The waypoints are where we were intersecting the school. Is that cool or what? Back to fishing. We lost the school temporarily but I located it two more times and we spanked the Stripers. Sweet thing was the kids were doing great and Loving it! As all good things go it finally petered out and we had to go catch bait. We caught about 125 more and set up in a couple different areas. The last area we hit we had some hogs hooked up but could not get them in. Depressing but overshadowed by all the fun we had this morning. Ended up being a great day that we all will remember for a long time. Hope Robert can remember some of the tricks I showed him today so he can take his wife back out and put her on some nice Stripers. And Yes, there are still Stripers in Lake Anna!